Heart Journey to Your Creative Spirit! Rejuvenate with Nature, Creativity & Spirit! There's space for 9 Spirited Women, so send in your deposit now! Feel how the gifts of time, nature & creativity will lead you to the vibrant soul life that is uniquely yours! Make this the year your dreams become a Reality! This Heart Journey Retreat, for a small group of women, will focus on three major themes: creativity, spirituality and the value of retreating to awaken and nurture both. A fourth element, the wild and stunning beauty of nature, will be the inspiring backdrop for your retreat—until you discover that all of Creation is an active partner in your process! Our Heart Journey will be limited to 9 spirited women. You will be part of a small group exploring the Art of Retreating in a beautiful setting while discovering and/or developing your creativity. Something wonderful will happen to you: you’ll feel the alchemy of the elements of nature, creativity, and spirit leading you effortlessly to your deepest and most personal spiritual life. Don’t worry if you think you’re not creative or if you believe you’ll go nuts with “nothing to do.” Don’t stop yourself because you feel you are spiritually bereft. You’ll never know who you are until and unless you challenge the limiting ways you see yourself! Picture yourself in one of the most beautiful, dramatic and spectacular natural settings you can imagine. From a mountain top, see the entire Napa Valley below you. Feel your body lying upon Mother Earth, a soft bed of earth beneath you, and hear the sounds of nature all around you. Put your feet up on your deck, sip a lovely raspberry tea and watch the colors of sunset deepen as the day moves seamlessly toward the night. Dive into your inner landscape—it is safe to do this. Discover parts of yourself that are new and exciting—revelations that spark your energy and imagination. Challenge yourself and feel supported by new and familiar “sisters.” Lean your head back as you watch the autumn constellations move across the sky until the waning moon rises. 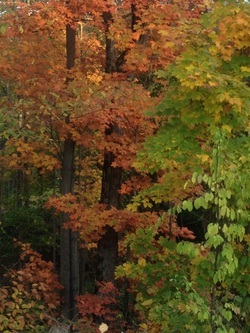 Breathe deeply the crisp air, all the way into your being. Let yourself be at peace. Go ahead: close your eyes now. You may be someone who feels fear or anxiety at the notion of being alone . . . unfortunately, retreating has become a “lost art” as we live in a culture driven more by busyness, distraction, stress, pressure, anxiety, depression, sound bites, shallowness, noise and meaninglessness. Even those experienced in the Art of Retreating will often feel some resistance. Don’t worry—this retreat will encourage beginners. The support of the group will help you confront any discomfort that may come up, so you can break through to your true self. You know her—she’s the one who hungers for some time alone to think, to reconnect with the parts of herself she has had to abandon, to heal the parts of herself that are ill, to grieve her losses so she can begin creating the life she craves. “She” is who you are—you just need to remember her. You may be someone who says, “I don’t have a creative bone in my body!” every time the subject comes up. You needn’t feel alone on that score, the world is full of women who have lost that part of themselves in our overly intellectual culture. But consider this: half our brains are wired for creativity. Maybe you just haven’t found that part of yourself because you think it isn’t there. Workshops presented during this retreat will be your opportunity to think again, and be open to its discovery in a safe environment. 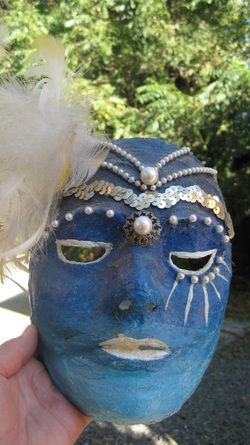 Creative Mask Making will be offered to help you unleash your inner Spirit Artist and Goddess! We all need to know how to be in the creative flow of life to thrive, live in our hearts and follow our intuitive wisdom! 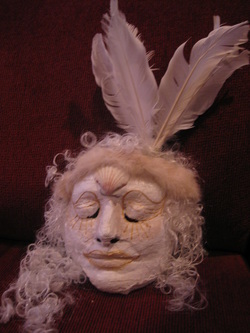 I will lead you in the healing art-as-meditation process of Mask-Making. You will leave with your own "Masterpiece Mask" revealing the masterpiece within YOU!! Making a mask is an act of power. Your mask will be a reflection of the inner light of your soul. We will venture into the world of color and images as viewed through your inner eye and imagination. Come with an open heart! No art experience is necessary. 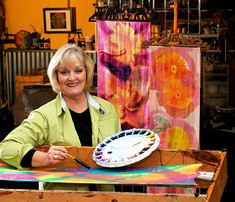 Carol Lorraine in her studio. 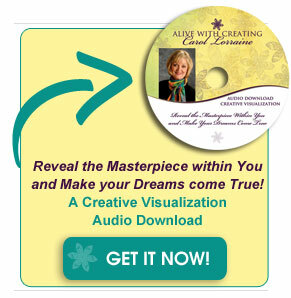 Carol Lorraine, Artist, Life Coach, Spiritual Creativity Mentor, Speaker & Author of Seven Steps to Creating Your Heart's Desire e-book and home study program. I am passionate about awakening creativity, aliveness and authenticity in others. For the past 25 years I have guided and mentored people to live their visions, express their passion and make their dreams a reality based on their true natures. While I am well known for my colorful inspiring artwork of mandala drawings and hand-painted silks, people share that they are inspired most by my message of living authentically, joyfully, and courageously. As an artist and teacher for the last forty years, I’ve taught art, drama, and music at the elementary and college levels. Considered a renaissance woman by many, I integrate my love of beauty, nature, and creativity into everything I do. I earned a Master of Arts Degrees both in Costume Design and in Creation Spirituality. I use my talents in costuming, mask-making, puppetry, mandala making, watercolor and music, to awaken people to their true nature & creative spirits. When I receive your email or call, I’ll send you an initial questionnaire about the retreat and then set up a phone call to go over all the details for this special retreat experience!